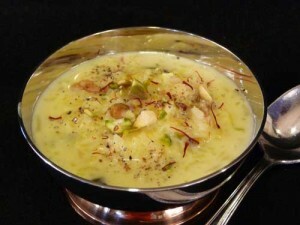 Badam Ki Kheer recipe by Bobo at DesiRecipes.com. Mostly made of almonds, fresh cream and milk, the Badam kheer is very scrumptious and fulfilling. Set the milk out on the stove on medium high heat. While the milk gets heated, in a blender grind the peeled almonds with a little milk. Add the thick paste into the milk already on the stove. Leave it to cook for about 15 mins. After which you need to constantly stir to avoid forming any lumps. Keep stirring for about another 15 mins. Add the whipped cream or the fresh cream to the milk which at this time should seem and appear very creamy. Add the safron (which should have been dipped in a cup of milk and put aside to give out color, at the start of the process). Add elaichi as you keep stirring. The milk in the pot should be a little less than what you initially started off with because at this point it should be very smooth and creamy. Keep stirring for another 15 mins. You know its ready when it tastes very smooth, creamy, and almondy. Add kewra (rose water) if you want. You can add food coloring if you want to give it a more yellowish color. Although the saffron should be sufficient to give the kheer a pale yellow color. Once finished transfer it into a dish and garnish with elaichi .